Review of the Internet website “Evangelischer Widerstand,” http://evangelischer-widerstand.de. The interactive website “Evangelischer Widerstand” (www.evangelischer-widerstand.de) is a powerful presentation of the Protestant Christian resistance to Hitler in both German and English. Automatically detecting my country of origin, the English website loaded a moving audio-visual introduction: “Imagine that your desperate exhortations go unheard. Would you nevertheless repeatedly call for solidarity with persecuted individuals?” The answer to this question is a short narration about Elisabeth Schmitz, a Berlin high school teacher who appealed to Confessing Church leaders to help Jews, wrote an important memorandum on the topic, aided persecuted Jews, and quit her teaching position in protest against the National Socialist system. Three similarly worded questions follow, on the subjects of refusing to endorse the Nazi regime, rejecting the values of the Nazi legal system, and voicing anti-war convictions during the Second World War. In turn, these questions are answered with biographical snippets about Otto and Gertrud Mörike, a pastoral couple; Martin Gauger, a Confessing Church lawyer; and Johannes Schröder, a Confessing Church military chaplain who became an anti-war activist. Bridging to the motto, “Resistance!? Protestant Christians under the Nazi Regime,” the splash page dissolves to reveal an attractive map of the Third Reich covered in icons of men and women. There is much to commend about “Evangelischer Widerstand.” The Protestant Working Group for Contemporary Church History is entirely correct in its awareness of the need to tell the story of the German churches under Hitler in new ways to new generations. This website is far more likely to reach young German Protestants than any of the excellent histories which continue to be written by scholars in Germany, Britain, North America, and elsewhere. The compelling questions posed in the introduction to the website raise fundamental moral questions and anticipate a website that presents meaningful stories of unambiguous Christian resistance to Nazism. The inclusion of photographs, documents, and audio clips adds to the interest, and the decision to tell the story of Christian resistance largely through bite-sized biographies of famous (and not so famous) Germans is surely the most engaging approach available. Included are the expected personalities like Karl Barth, Dietrich Bonhoeffer, Martin Niemöller, Wüttemberg Protestant Bishop Theophil Wurm, and the Kreisau Circle, along with Catholic Bishop Clemens August Graf von Galen and Anglican Bishop George Bell, to provide some international and ecumenical flavour. But there are also lesser known Christians: attorney Hans Buttersack, vicar and teacher Ina Gschlössl, teacher Georg Maus, and vicar Katharina Staritz. The witness of their lives and opposition to Nazism within the ecclesiastical realm demonstrate that there were indeed members of an “other Germany” who did not bow to Hitler or abandon persecuted Jews. from partial discontent to disobedience and protest up through coup attempts, resistance in the narrower sense of the word. At issue was defending the Church’s right of existence and the authenticity of the Christian message from the threat of ideological dictatorship as well as defending the rule of law and human dignity in an unjust regime. Except that it doesn’t. 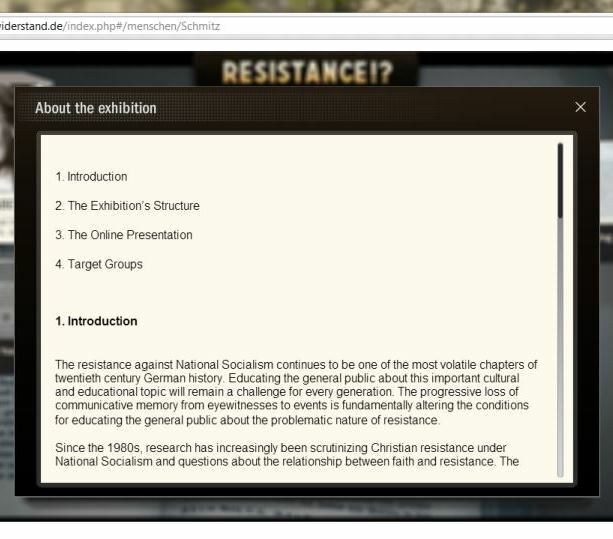 Visitors to the “Evangelischer Widerstand” website are unlikely to leave with the impression that Christian resistance was the exception in the Third Reich. I have quoted extensively from “About the exhibition” because it explains two basic flaws that run right through the website: the definition of resistance and the assumption of resistance. The result of the near-universal employment of Resistance and Widerstand is to suggest that every church protest against some specific Nazi policy or particular encroachment into the ecclesiastical realm was akin to a principled opposition to National Socialism as a movement or to a forcible attempt to overthrow the Hitler regime. The professional historical scholarship on the German churches in the Third Reich abandoned this simplistic interpretive approach decades ago. There’s no good reason why the Protestant Working Group for Contemporary Church History, filled with excellent scholars, should employ such an outdated interpretive concept of resistance today. The second weakness of the website is the assumption of resistance. The treatment of individuals and topics runs from heroic resistance to compromised resistance, but never to indifference, compromise, or collaboration, which were in fact the normative responses of Christians in Nazi Germany. For instance, in the “Fundamental Questions” section of the site, the introduction begins with a window called “Action at the Margins,” which states that “Resistance in totalitarian regimes means action at the margins: The divide between (un-)lawfulness and justice, between courage and foolhardiness, between reasons of state and conscience. Christians’ resistance against National Socialism is no exception here.” The introduction moves on to discuss “Christian Resistance” within the context of a totalitarian Nazi regime, “Action in Obscurity.” Another window on “Fundamental Questions” briefly mentions that the questions of resistance are not merely about “black and white or good and evil.” After that, however, there follow several more windows on motivations for resistance, Christian and Church resistance, and denominational and ecumenical resistance. Further along, a “Contradictions” area notes how Christian faith could also “crush the potential for resistance.” Yet even here the authors of the text do not consider indifference, compromise, or collaboration. They only note that resisters grappled with the command of Romans 13 to obey political authorities and debated “the ethical justifiability of tyrannicide.” The text continues: “This ambivalence is reflected in many biographies, even ones where faith initially made supporters of the NSDAP out of individuals who later turned their backs on National Socialism and became its opponents.” So ambivalence is present, but generally appears to have been overcome in the lives of Christian resisters. Other parts of the “Fundamental Questions” section treat issues such as Christian ethics, defense of others, consideration of consequences, gender-specific resistance, and contrasts between clergy and laity. But the net result is still a site devoted only to resistance, and not to a consideration of the wider range of responses to Nazism among Protestants—or Catholics, for that matter. A similar analysis could be made of the timeline. Here the web historians offer up three streams of articles—on the “Regime,” on “Majority Protestantism,” and on “Christian Resistance.” There are entries about Hitler’s misleading pro-Christian statements, the German Christian Faith Movement, and other aspects of the history of Protestant collaboration with the Hitler state. Still, in the crucial 1933-1934 section, the 19 articles devoted to aspects of Christian Resistance are almost double the 10 entries given over to the compromised majority Protestants, once more creating the impression that Christian Resistance was, in fact, the most obvious Christian response to the Nazi dictatorship. One might protest that the aim of “Evangelischer Widerstand” is just that—to highlight Protestant resistance. Fair enough, but when the stated goal of the Protestant Working Group for Contemporary Church History is to “appeal to users with different educational backgrounds and interests and of different ages” (i.e. to engage a younger, web-surfing generation) for the purpose of “educating the general public about the problematic nature of resistance,” such an unbalanced telling of the story creates a false impression on uninitiated viewers of the website. Coupled with the misleading use of the term resistance for all forms of ecclesiastical opposition, “Evangelischer Widerstand” as a flawed educational resource. Because of these two weaknesses in the website’s approach to presenting the history of the German churches in the Third Reich, “Evangelischer Widerstand” works best when it tells the stories of the heroic, deeply-principled Christians who acted decisively against the regime and its policies. Elisabeth Schmitz is a good example. Just as Manfred Gailus has recently argued in his fine history Mir aber zerriss es das Herz. Der stille Widerstand der Elisabeth Schmitz (Göttingen: Vandenhoeck & Ruprecht, 2010), Elisabeth Schmitz was a remarkable figure. A member of the “World Alliance for Promoting International Friendship through the Churches” from 1928 on, she conscientiously taught religion, history, and German to high school students but refused to join the National Socialist Teachers’ Association. Instead, she joined the Confessing Church, soon criticizing its spokesmen for their disparaging comments about Jews and challenging its leaders to intervene on behalf of “non-Aryan” Germans. This protest culminated in her 1935 memorandum “On the Situation of German Non-Aryans,” described by the website as “arguably the most explicit protest within the Confessing Church against the persecution of Jews.” Schmitz wrote that the German Church was “inescapably entangled in this collective culpability” and could hardly expect forgiveness when “it forsakes its members in their desperate straits day for day, stands by and watches the flouting of all of God’s commandments, does not even venture to confess the public sin, but instead—remains silent?” Alongside this work within the Confessing Church, Schmitz courageously quit her teaching position in 1938. Applying for early retirement, she informed the Berlin school board that, “I have become increasingly doubtful whether I can teach my purely ideological subjects—religion, history, German—as the Nazi state expects and demands of me,” adding that, “this constant moral conflict has become unbearable.” She spent the rest of the war years aiding persecuted Jews, returning to the classroom once again after the Hitler regime had been swept away. “Evangelischer Widerstand” is less effective in more complex situations, as in the case of the journal Junge Kirche (Young Church). Ralf Retter’s thorough study of the Confessing Church periodical, published as Zwischen Protest und Propaganda: Die Zeitschrift “Junge Kirche“ im Dritten Reich (Munich: Allitera Verlag, 2009), argues that the journal was engaged in Resistenz (non-conformity) though not Widerstand (opposition) between 1933 and 1936. During this time, it opposed the German Christian takeover of the church governments, promoted the Barmen Confession, opposed both the introduction of the Aryan Paragraph in the churches and the abandonment of the Old Testament, affirmed the traditional historical narratives defending the long-standing presence of Christianity in Germany, supported the emergent ecumenical movement, and even criticized Nazi interference in the realm of the church. However, Retter also details the ways in which Junge Kirche abandoned the more radical Dahlemite branch of the Confessing Church after 1936, and how by 1939, its pro-Nazi editorial tendencies were growing clearer and clearer. When Junge Kirche linked its embrace of Hitler’s war aims with its mission to foster piety and provide spiritual encouragement among German Protestants during the Second World War, it’s editors turned it into a stabilizing presence in the Third Reich—quite the opposite of a force for resistance. Pressure on the editorial staff of the “Junge Kirche” to conform increased steadily, especially after the Nazi government changed its church policy in 1935. The balancing act between conformity and self-assertion grew more and more challenging. Government regulations had become so drastic by 1938 that the still remaining independent church press no longer had any latitude to report independently. The Reich Chamber of the Press eventually ordered the discontinuation of all religiously motivated magazines in the summer of 1941 on account of the war. In the end, then, the website “Evangelischer Widerstand” is a bold and innovative attempt to present the history of Christian resistance to a new generation. It holds great potential to become the leading online educational site for the history of German Protestantism under Hitler. For that very reason, it is incumbent upon the editors from the Protestant Working Group for Contemporary Church History to define and contextualize their use of “Christian Resistance.” Doing so would make their dynamic website into the premier Internet source of information about all aspects of the history of German Protestantism in the Third Reich—from the heroic to the disgraceful.